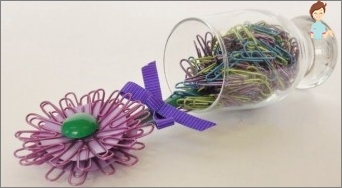 Crafts from paper clips - interesting, fun, creative! Home / Needlework / To not be bored at home, learning tinkering crafts from paper clips! To not be bored at home, learning tinkering crafts from paper clips! If the rain outside and get out for a walkabsolutely impossible, you should look for entertainment at home. But what if the apartment is in perfect order, dinner is ready, and the TV tired? You may want to be creative and make some crafts. By the way, this interesting case, you can bring the whole family and have fun. 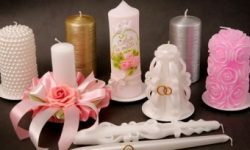 Master can be of anything, for example, try to make crafts out of paper clips, and if you do not know how, then read the article, it will be a few interesting ideas. 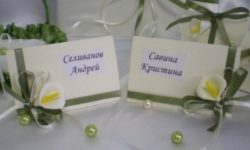 The simplest thing you can do from skrepochek - a bouquet that will not only please the eye, but also to perform a practical function, be responsible for the safety of stationery. Paper flower is ready, now it is necessary, usingpaper clips, to make beautiful colored petals and stems. To do this, the free edges of the three circles of paper placed colored stationery, and improvised green stem attached clip. 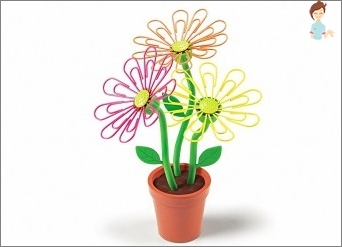 After all the manipulations flower is ready, it will be very good look in the organizer on the desktop, and to articles made of paper clips did not fall, it is recommended to press a bit line. Basically, if you do not flower with a 3 and 2 skrepochek circles, it will be more stable. 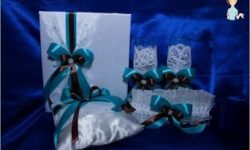 With the help of clips can be made with your own handsvery attractive garland, which, of course, decorate the room for any occasion. To make such beauty need not so much scrap materials: scissors, colorful sheets of paper, magazines and any suitable dense print, glue and staples. We perform these steps until until you get the desired length of the garland. By the way, if desired, the decoration can be done in several rows. And by using different size clips to create a very interesting general garland. It is worth noting that the diligent women on this principle carved curtains, and kids fun bracelets for yourself and friends. 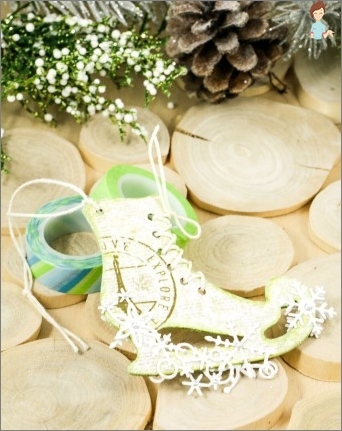 With the help of clips can make lovely Christmas toys in the form of skates for figure skating. On a sheet of paper, draw a horse, but without the blades, one shoe. Cut out the stencil, and then drag the image on the felt. Before you cut out the image of the fabric, foldit in half, so you could make a real horse. Cut in the middle of nothing. After cutting should have two skate in the mirror. In the middle of the felt blank distribute the clip, and then sew the edge of the future toys. Do this large stitches using the yarn of the color to blend in with the fabric. On both sides of the cross-linked products secure with glue beads or sequins, they will serve as a makeshift holes for laces. Last one's left a bar, a thin ribbon to sew a felt roof ridge, and you get a wonderful toy for a Christmas tree. By the way, such ornaments can be prepared on the day of the child's birth, if the baby is interested in hockey. This will help make the holiday theme. 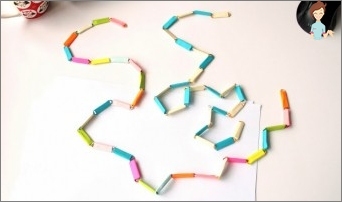 As you can see, crafts from paper clips, made with their own hands, can be varied. Everything is limited only by your desire and fiction. Do not be afraid to dream and to create, you can do it, good luck!